Flashback, more years ago than I am ready to admit to… I was still in school, and like all other kids my age I was trying to fit in and just get through it all. Trying to fit in was hard for me because I wasn’t like the other girls my age. I had a secret – one that I fiercely protected. It had the power to jeopardize my unstable standing with the social groups with whom I aligned myself. Weekly I would sneak into the local comic book store to pick up my subscriptions. If someone did see me, I told them I was picking them up for my cousin. At home, they were hidden in a dark corner of my closet, out of sight of the friends that came over. I would tear through them as soon as I was safely ensconced in my bedroom with the door closed. I would read them over and over again, waiting impatiently for the next issue to come out. As I grew older, I continued to read comics, and graphic novels. Then one day I discovered video games and board games, and my love for these things grew as well. I never lost this love for comic books, video games, and board games, bringing my collection into adulthood. The difference between then and now is that I am now open with my love of these things. It is now cool to like all of these things, and like them I do. This backstory leads me to today, an adult who still loves to read and play in fantasy worlds. When I heard about a new project from Van Ryder Games that promised to combine graphic novels and board games, I was immediately onboard. 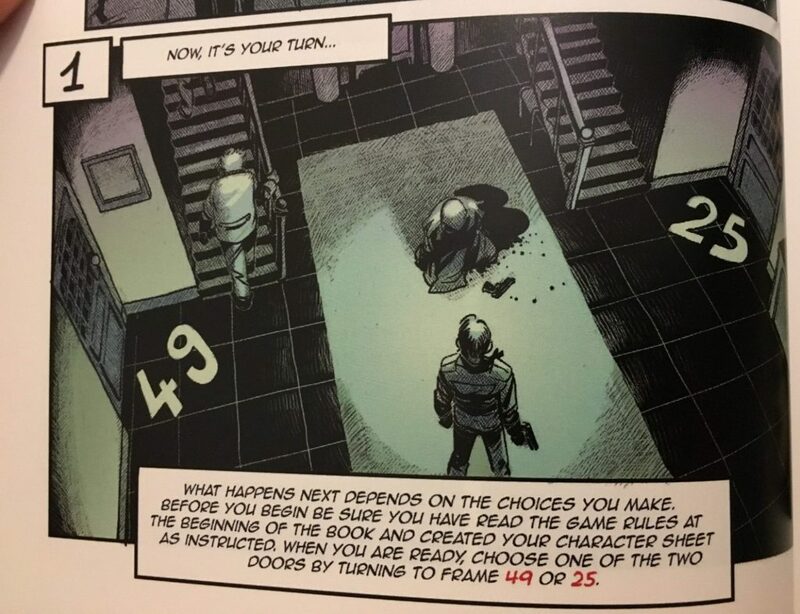 Captive, written by Emmanuel Quaireau and illustrated by Manuel Chevalier (currently on Kickstarter) is a graphic novel that doubles as a board game. If you grew up in the 80’s and 90’s you may remember a series of Choose Your Own Adventure books that did just this; books that allowed you to control the fate of the main character and that, more times than not, resulted in your untimely demise. Captive brings this idea to adulthood, adding gritty artwork and a more intense theme. Forgive me for being vague, it is hard to talk about Captive without giving away too much. It begins with your daughter being abducted and you receiving a ransom note which leads you to a creepy mansion in the dark. Armed with ransom money, a gun, and two sidekicks, you go about trying to get your daughter back. That’s where your story starts to branch from mine. Before you begin your adventure, you are able to “build” your character, choosing to add stats to your base stats in dexterity, health, and stamina. You will keep track of these stats along with health, time spent, and inventory as the book progresses. Spend too much time and your daughter is lost. Lose too much health and, well, you die. Each of these values will come into play during the story, often directing you to a specific graphic panel if your value is equal to or less than, or a different panel if it is greater than. This status check was a nice twist on the story, making your choices even more important. 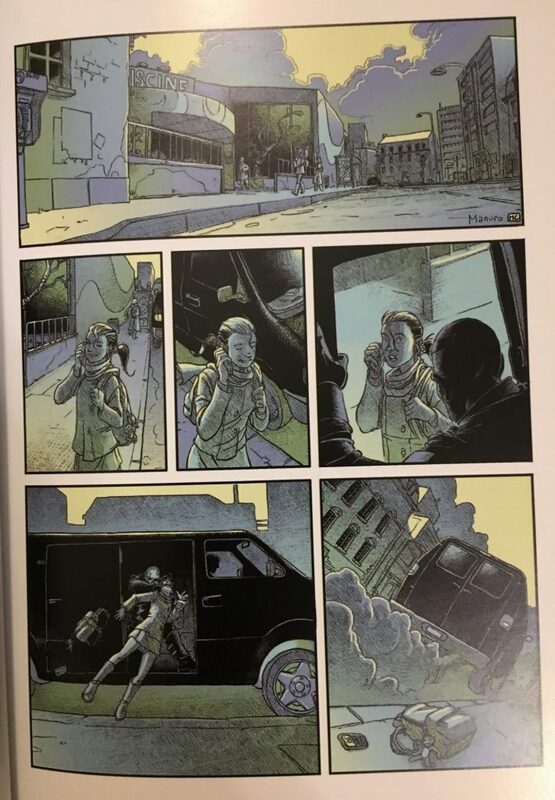 The book reads quickly and, in true graphic novel form, it gives you plenty to see in each panel. The instructions direct you to keep your eyes out for hidden clues. If you miss these clues, you will be stuck in an endless loop (much like I was) for a bit. Once I realized that these clues were not just to be seen and recorded but to be acted upon, the story took off for me. The artwork is well done and the choices are plentiful. I have read through my copy more than a dozen times and have yet to have the same experience twice. 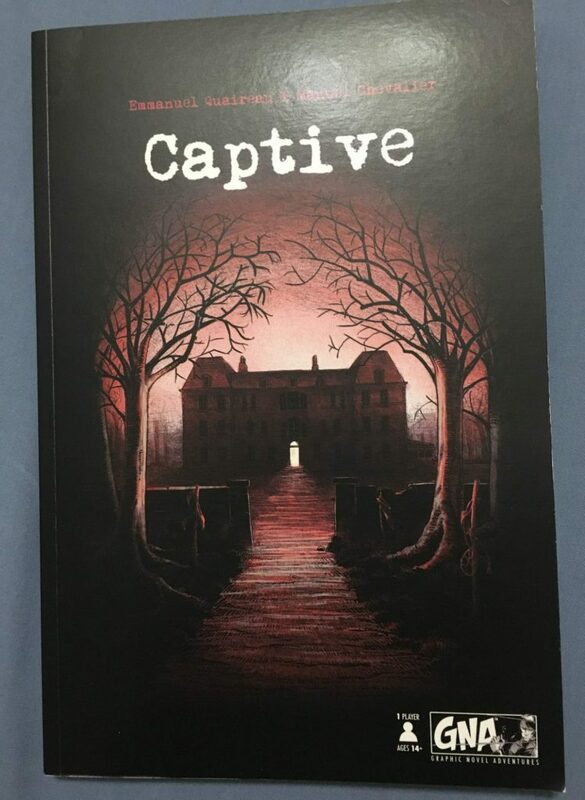 If you were a fan of Choose Your Own Adventure books, Captive will be a nostalgic blast from the past. If you are a fan of graphic novels, this will be a new twist on a beloved medium. If you are a fan of both, you are in for a rare treat: a blending of both! Van Ryder has already announced four more graphic novels in their Graphic Novel Adventures series, also available during the Kickstarter, in different genres including a Sherlock Holmes, Werewolf, and Western themed adventure. Each title in this set offers a completely different experience, appealing to different tastes in themes as well. If this sounds as amazing to you as it did to me, you can check out the Kickstarter currently running through April 24, 2018! Terribly hard to order via kickstarter -> van ryder games. And even more terrible to communicate with the dealer -> van ryder. Also the kickstarter prices are not real and the dealer prices are more expensive. Van Ryder did not answered why is that and ignored my questions. I am sad and dissapointed. Wanted those books badly, but not possible to order it.